An iron clad shrub for western Oregon. It endures heavy clay soils, summer drought and the coldest temperatures we can expect with no harm. 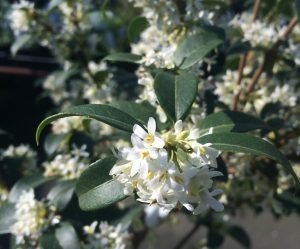 Dapper evergreen shrub with handsome matte green leaves. In February and March masses of small tubular white fragrant flowers crowd the stems and emit the perfume of vanilla. Very drought tolerant but adaptable to regular irrigation as well. Avoid permanently wet sites. To 7′ x 7′ in 7 years. Tolerates subfreezing wind and is useful as a hedge/windbreak in areas exposed to gorge outflow. Blooms on wood from the previous season prune- if needed after flowering. Tolerates quite a bit of shade.